13 ½” X 19” serigraph print--contemporary design. 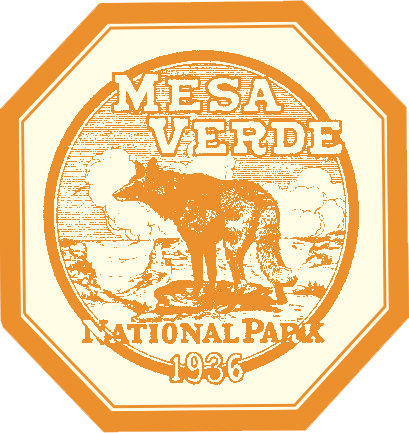 To celebrate the centennial of Mesa Verde (2006), I was asked to create a design to fit into the historic set of posters. 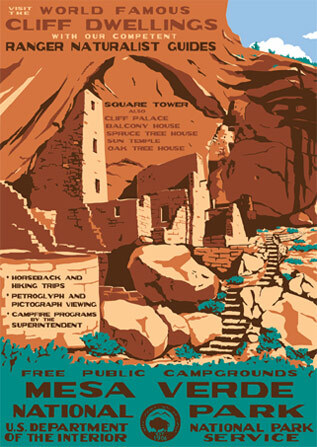 The park insisted on using Square Tower which is the tallest Ancient Puebloan structure in the park. This site, while visible from the roadway, has been off limits to visitors since 1940. With a park guide we were lucky to explore this site carefully using ladders and ancient footholds to climb down the cliffs. We produced 150 limited edition prints with a centennial logo (now sold out)--this is an open edition.